I’d like to take a moment and highlight what I believe to be two of the greatest hidden treasures of the glorious Hongdae. For those who aren’t in the know, Hongdae is a very lively part of Seoul with a really great art university, and some of the cutest coffee shops, restaurants and boutiques around. It’s also where a lot of dignity goes to die every Friday and Saturday night at places like Zen 1 & 3, “The Park” and Papa or Mama Gorilla…. if you’re really feeling like making some mistakes. 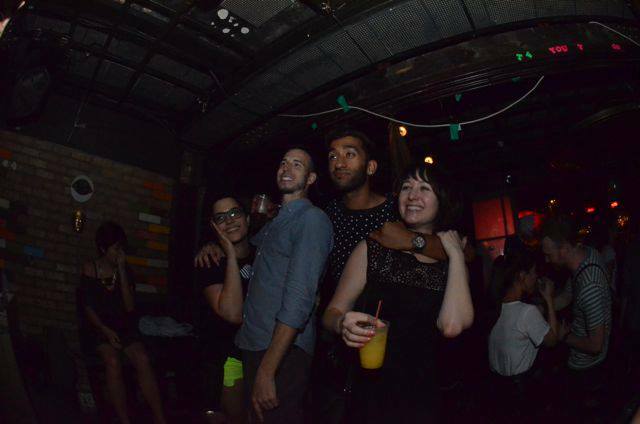 Of course I love a good solid night of awful 1,500won tequila shooting and dancing to the same songs over and over again, weekend in and weekend out, but I do enjoy a change of pace every now and then. Well, I recently discovered the bar Myoungwolgwan (MWG) which holds a Shindig night once a month, where all they play are tunes from the 50s and 60s. And let me tell you, that tiny little wood paneled bar gets all kinds of dirty dancing up in thurrrr! 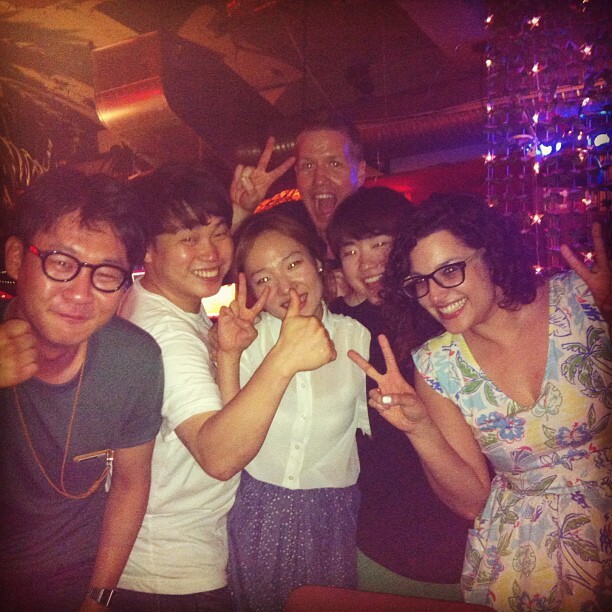 I don’t think I’ve had more fun during a night out in Hongdae than I have the past two times I’ve gone to Shindig! Hatches new visions of Richard Simmons’ sweatin to the oldies. The first time I literally stumbled on it because my friend Dustin, who recently came back into town for the summer, had a friend DJ’ing. We went, we sang jovially, and we got way down with our bad selves. 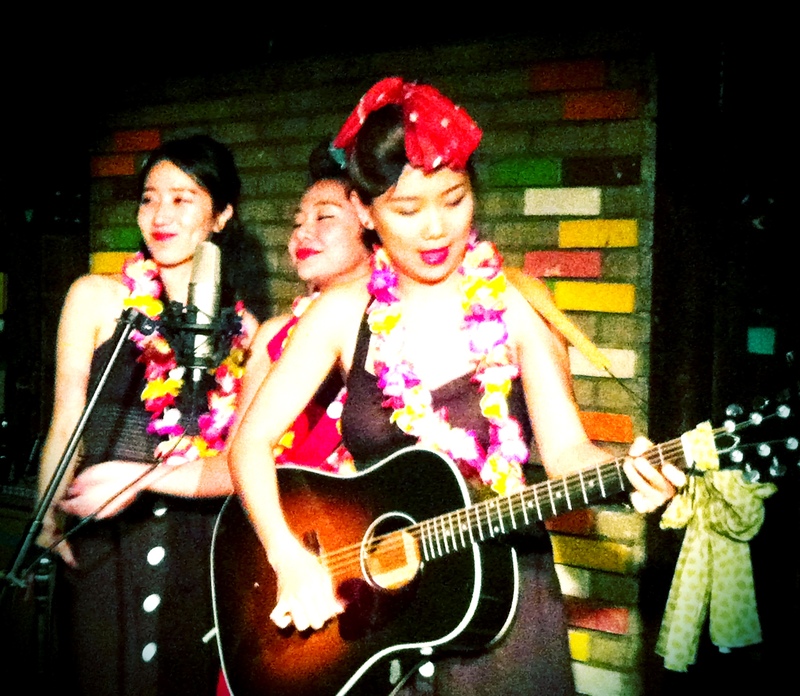 This last one in June was a Tiki/Beach theme (perfect opportunity to rock my dress adorned with palm trees), and was their first foray into live music with a girl group called The Barberettes, and a little Korean man who tried desperately to imitate Johnny Cash. They played some jams to kick off the night, and then the tunes started bumping and the dancing got underway! For those who are looking for a way to boogie down and can’t get enough oldies in their life, MWG’s Shindig is located just behind Hongdae Park. When you walk out past the bathrooms, keep going straight and pass Exit and it’s just past it with a lotus sign. It’s 8,000~10,000won cover, and that gets you a free beverage as well as lots of burned calories once you start shakin your groove thang. 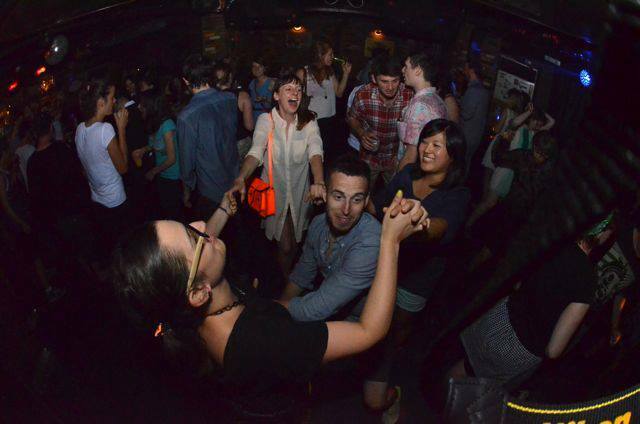 My other favorite hidden gem of Hongdae is a poppin retro bar called Gopchang Jeongol. Andria, Jee and I started our birthday celebration here earlier this year, since we are ajummas and all. It was only suiting we spent an evening celebrating our long lives to the tune of Korean rock n roll from decades past. This place has the coolest vibe and is decked out with hundreds of records, photos of old groups, vintage radios and clocks covering the walls. Granted I can’t sing the songs that play because they’re all in Korean, but they still have that awesome oldies retro vibe that I totally crave in my life. But then there’s that glimmering moment when I recognize an American song redone in Korean and belt it out in my own English bubble. Assa! This last time I went before Shindig with Josh, Andria and a few of Andria’s friends, for an evening of retro. There was this one table of 2 Korean couples who were so out-of-this-world jammin’ along to every song that came on. They were having the best time (and as we found out later, smashed out of their minds!) At some point in the night, they got up and came over to our table, where Josh and I put on our ever-present dancing shoes, and started jumping and awkward dancing and singing right along with them. Here we are all happy-faced out with our new friends of 15 minutes, before the girl in black irked Josh out and fell off her chair. Oopsie daisies! We have tried to find this place a few other times, and Josh and I always got lost. But, should you chose to navigate Hongdae and treat yourself to a feel-good evening (which you totally should), here’s how to orient your internal compass. Go out exit 4 of Hongik Station and walk towards the main street. Turn left down the street and make your first left. Keep going to the end of the road and take a left and walk until you come to a roundabout. Take the first right, and keep walking down that street until you almost come to the end of the road. It’ll be on your left down a little staircase. You have to order some food too, along with your drinks, but that’s pretty standard for most Korean bars/hofs. I seriously hope you go, boogie down and enjoy both as much as I do!